Social intelligence is a theory that has plagued psychologists since the 1920s. It was originally described by Edward Thorndike as “the ability to understand and manage men and women, boys and girls, to act wisely in human relations.” Is the improvement of social intelligence the key to success and happiness in your life and career? 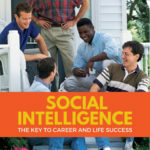 Social intelligence is, put simply, the ability to get along with others. These relationships are integral parts of our everyday life, whether they are personal or professional. Your social skills determine how people react to you, how they think about you when you are both present and absent, and how willing they are to work with you. Think back to the last time you were at a party or in a crowd of people. It’s in situations like that where it is easiest to find people with high levels of these skills. They’re the people who are the center of attention, or those who can flit from group to group and talk to people effectively without feeling apprehensive or self-conscience. They understand what makes people tick, and are very skilled at reading people. This type of people-centric intelligence is actually part of a theory put forward by Howard Gardner, a professor at Harvard. He theorized that human intelligence was broken up into a variety of that could not be defined by a single IQ test. These include practical, emotional, abstract, kinesthetic, and of course social intelligence. Most people combine traits from each of these, but some do lean strongly toward one or two specific types of intelligence. Like any other form of intelligence, there are plenty of ways to improve your social skills. Mind your Body Language – No one is going to want to initiate a conversation if you’re standing with your arms crossed and your shoulders hunched. This sort of body language says “I’m closed” and indicates that you have no desire to participate in any conversation or activity. Try standing with your hands at your sides, with your back straight and your shoulders back. This is a much more open and welcoming pose. Talk to people! – This isn’t as complicated as it sounds, though it can be difficult especially if you are shy. Start small, by getting involved in a conversation with your friends where you would have normally remained quiet. Try initiating small talk with strangers while you’re standing in line. Just making a comment about the weather, the ridiculous price of gasoline, or some other mundane topic that is common knowledge can be enough to spark a conversation. Be Confident – Just exuding confidence can be enough to make you more approachable. And you will notice that the more confidence that you project; the more confidence you will begin to feel. And confidence is the root of all of your social skills. Learn to Listen – Don’t just collect sounds with your ears, any Neanderthal can do that. Instead, learn how to really listen, and gather information from the things that you hear. This will make you a much more vital conversational partner, and people will begin to seek you out because you listen to what they have to say, rather than just hearing the sounds that they produce with their mouth. Have a Good Sense of Humor – There’s nothing better than a good laugh between friends. A good sense of humor can earn you lots of friends because everyone loves to laugh. Just be careful with your jokes until you are sure of your audience, you never know what might offend someone. Know your Audience – Even though we have escaped high school and its social cliques, there are still commonly recognized social norms to which we all must adhere. Make a point to know the accepted norms for the group that you will be associating with. Don’t show up to a cocktail party in jeans and a t-shirt and don’t make jokes about rich snobs if you’re hanging with the country club crowd. Do you research, or find a friendly comrade to follow around until you’ve learned the rules. Grow your Wings – In most cases, there are no rules stating that you have to join one social group and remain with them. Grow your wings and be a social butterfly! This is especially useful if you’re at a party or a large gathering and you don’t know everyone. Flit from group to group, introduce yourself and insinuate yourself into the conversation. Don’t be afraid of being rejected by any particular group either. learn from your rejections. What could you have done differently? And don’t automatically assume that any social rejection is your fault. Look at the situation from all sides. Were the people in the group presenting closed-off body language, like they didn’t want anyone to bother them? There are easily dozens of possibilities or reasons as to why they rejected your attempts at conversation. Don’t Be Afraid to be Assertive – This doesn’t necessarily mean barging in and taking over the conversation. It could be as simple as actually expressing your opinion rather than going along with whatever the group consensus is. If you don’t want to go to a particular bar, for example, speak up! You may be overruled, obviously, but at least you took the time to assert yourself and make your opinion known. Set Small Goals – This could actually be applied to every aspect of your life. Don’t set “improve my social skills” as a goal. It’s too general and could be difficult to achieve. Instead, break it down into its component parts (as listed above) and set an individual goal for each aspect of your skills that need to be improved. Now that you have a better idea of what you need to do to improve your social skills, here are some games and activities that are designed to do just that. You may find that many of these activities are designed for children, but don’t let that discourage you. The concepts are sound and in many ways, these activities and games are actually more effective than ones that might be designed for adults. Eye contact is an important part of improving your social skills, but it is the one thing that many people neglect. The easiest way to learn the confidence to make eye contact is to find a good friend or someone that you are comfortable with and have a staring contest! Not only does this appeal to the competitive streak in each of us, but it also makes you more comfortable with the concept of staring someone in the eye as you speak to them. Reading body language and facial expressions can make improving your social skills much easier. It gives you the ability to determine the mood of the people that you are talking to. Believe it or not, you can learn some of these skills by watching TV. Actors are skilled in portraying their characters not only through the lines that they speak but through the expressions on their face and the way they hold their bodies. These professionals can speak volumes by shifting an eyebrow or changing the way they cross their arms. Charades! Change the rules of the traditional game of charades a little bit. Instead of trying to guess a movie title or actor’s name, try to convey a complex emotion. Don’t just stick with happy or sad or angry. Pick emotions like elation, depression, rage, jubilance, or fear. Communication is the key to strong and balanced social skills. It’s hard to be social if you can’t express your opinion or talk to anyone. Here are a few activities that you can use to improve your communication skills. Play up the small talk! – Make it a point to start a conversation with one stranger no matter where you go. If you’re in line at the store, talk about the weather. If you’re sitting at the DMV, commiserate about the insane amount of time that you all spend there. Once you start making it a habit, it will get easier and easier. Step out of your comfort zone – It’s tempting just to stay home and avoid social situations if your skills are lacking. Instead of staying safe, get out of your shell! Head out to a bar with friends, or find a party and get yourself invited. Act the part, even if inside you’re scared out of your mind. If you act confident, they’ll never know you’re terrified. Start a neighborhood project – This is more difficult thanks to the current tendency of people to avoid their neighbors wherever humanly possible. Find a cause or a project, and do everything you can to get your neighborhood involved. This could be something as simple as turning an abandoned lot into a community garden. When people come together to work on a project, they tend to get closer and become more social. Who knows, maybe you’ll start a trend! Social intelligence can be difficult to learn if you don’t already have the inherent skills. These skills, though, are ones that should be sought no matter the difficulty, because a high level of social intelligence is indeed the key to a happy, successful, and productive life.